Despite what many have referred to as a clear or even robust housing recovery, most Americans continue to believe that we are still in the midst of a housing crisis. A new survey released today by the MacArthur Foundation titled, “How Housing Matters,” found that 41% of Americans think we’re “still in the middle” of the housing crisis that began back in 2008 when unsustainable home prices came crashing down. Another 20% believe “the worst is yet to come,” meaning nearly two-thirds of Americans aren’t convinced that the carnage related to shoddy mortgages and overpriced homes is over. However, these numbers are down from a year earlier when they stood at 70% collectively, and much better than the 77% who held those views in 2013. Meanwhile, 55% of respondents said they had to make at least one sacrifice/tradeoff in the past three years to pay their rent or mortgage, with many having to work more, stop saving for retirement, or move to areas considered less safe. Even if they did want to buy a home, 60% said it was a challenge to find an affordable property in their community, up from 59% in 2014. But maybe that’s just how they feel, and not the reality of the situation. There’s also a widespread belief that banks are foreclosing more these days and that accumulating wealth via homeownership (building home equity) is no longer as tenable as it used to be. The one sliver of good news is that more Americans perceive homeownership as appealing again as a long-term investment. Back in the 2013 survey, 57% of the public said purchasing a home was becoming less appealing, but in the latest survey 56% said they felt it was an excellent long-term investment. Here’s the problem. 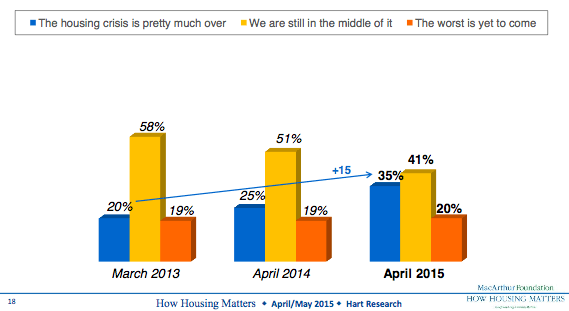 If you fret about the state of housing until it looks like a sure bet, you’ll probably lose. And that might mean losing a second time if you followed this logic during the prior boom. It actually makes more sense to buy things like stocks and real estate when pessimism is still in the air. That’s when opportunity is at its best. When nobody is worried, bubbles tend to be on the horizon and price drops will soon follow. The unfortunate thing is most investors and Wall Street bulk buyers have already gotten in at bargain basement prices when the general public was still reeling from the crash. Chances are they’ll unload when the American public’s fear finally subsides, at a time when prices are perhaps just within reach for many Americans. This probably explains why we tend to repeat history over and over. The smart money gets in cheap, sells it to those who can’t afford it, and then we have a crisis on our hands. The silver lining is that pessimism remains in today’s real estate market, meaning there’s still upside potential despite the recent double-digit gains. Colin, I would like to add that your articles have helped me and my husband through our refinancing. You’ve provided us with so much information. Thank you for doing this. Each article is so important and very well written. Thanks Vanessa, glad you found them helpful!